If there's one thing we know about at Triptease, it's online conversion rates. The funnel leading from curious website visitor to satisfied hotel guest is one we spend every day tracking, tweaking and optimising for the thousands of hotels we work with - and we know that some hotels are being held back by a booking engine that's simply not working hard enough for them. We've aggregated over a million conversion events (i.e. 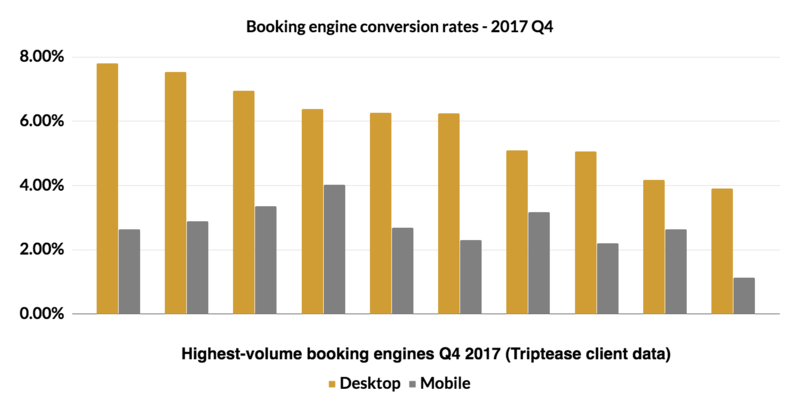 hotel stays booked online) from the last three months of 2017 to see how well leading booking engines are converting your guests. It's time to see how well yours measures up. Is your booking engine a conversion machine? 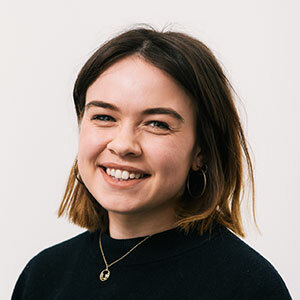 They say that you're more likely to get divorced than change your bank account - and the same might be true when it comes to hoteliers switching booking engines. Martin Soler recently bemoaned the fact that "it's 2017, and hotels still use a website paradigm that dates from 2005" - namely, split 'showcase' and 'e-commerce' sites, often with little continuity between the two. The rise of mobile shows no signs of slowing, and clunky sites ill-suited to a smaller screen aren't going to do your conversion rate any favours. There's also the simple fact that all the careful brand-building in the world can be instantly deflated by a frustrating or cumbersome purchasing experience. If you're serious about driving direct bookings in 2018, it might be time to reconsider your booking engine. 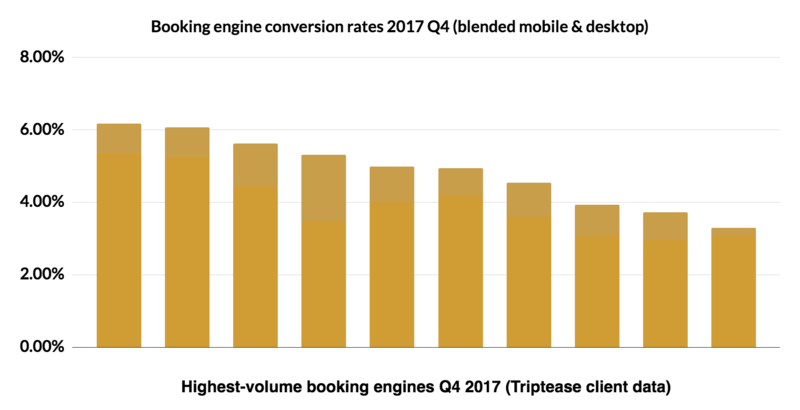 We took a look at the booking engine conversion rates over millions of sessions we tracked from October to December last year - and it turns out some booking engines are doing a far better job than others. While we're not at liberty to disclose the rates for individual BEs (sorry), we'd recommend checking how your desktop, mobile & blended conversion rates measure up against those displayed in the charts below. Bear in mind these conversion rates are from the booking engine only, not the website as a whole. That means the potential guest has run a search and is looking through your rooms and rates (i.e. they're further down the funnel than someone who has just landed on your homepage). This data covers over one million conversion events between October and December last year. We've selected a representative sample of 10 booking engines to display here, each of which had well over 5,000 conversion events during the period. Of course, the size, type and location of your property should all be taken into account when interpreting your own conversion rate against these results. However, if your blended booking engine conversion rate is sitting around the 3% mark, it's worth seriously considering whether your booking engine is working hard enough for your website. At the very least, check with your booking engine if you're performing poorly against their internal benchmarks; if so, don't hang up the phone until you've found out why! If you're one of the smart cookies with a booking engine conversion rate inching towards the 6% mark - give yourself a big pat on the back. You're in an ideal position to ramp up your direct bookings in 2018. Remember that funnel though - a high conversion rate on your booking engine isn't too helpful if the conversion of visitors from your main website to the BE itself is minimal. And what about how your mobile conversion rate compares to your desktop? A few of the strongest desktop performers slide right down the rankings when we factor in their mobile rate. For better or worse, the 'showcase' to 'ecommerce' website setup is likely to remain the industry standard for the imminent future - which means it's crucial that you stay on top of your booking engine's performance, and be prepared to make a change if you need to. Superficial tweaks will have minimal impact if the core structure of your site is destined to under-perform. A strong hotel website is like one big jigsaw puzzle - and we're here to help you put the pieces together. Take a look round the rest of our blog (our Direct Bookings section is crammed full of useful tips), check out some of our success stories or just drop us a line if you fancy a chat with one of our Direct Booking Experts.